We talked about it on CCTV-Dialogue, the Chinese State TV program. 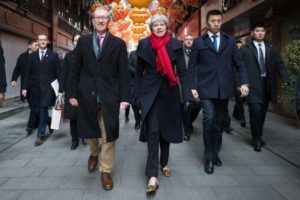 May is slowly trying to forge a relationship with China that is independent of the European Union. In Brussels, of course, it is hoped that the British mission will fail because the dogma TINA (There Is No Alternative to the Union) cannot be questioned. God forbid if a country that leaves the EU could survive or even do better from the outside. As expected, China lifts a ban on beef for other countries, not just for Italy. China has lifted the ban on beef imports, just as it had already done for Italy a few weeks ago. At that moment, my comment was that China decides to import products from Europe when it needs it. In the case of beef, it produces 7,000 tons but consumption is around 8,000 tons. So, just as it had been for Italy, even for GB there is very little to rejoice: China has agreed because it needs it. Britain has now acquired that flexibility in the negotiations on trade with China that it did not have when it was entangled in the European Commission labyrinth. Let’s see now what agreements she will succeed in forging with China and if we too, in Europe, could use them as a benchmark for our negotiations between the EU and China. My invitation is to help Britain do well with China and then try to ride the same success. But perhaps, as I said before, in Brussels, they prefer a strategy that does not maximize the benefits for European citizens but aims to penalize the English ones.